At Terrapin Adventures we like to bring light to the importance of nonverbal communication in everything we do, including team building. When athletes are in tune with each other they almost seem to anticipate the other’s next move. A no look pass in fact, is more likely that they are reading each other’s non-verbal ques. There are many different people that have categorized nonverbal communication and they can range from 6 – 9 different types but I found Judeek K. Burgoon’s classifications to be the most true. She classified nonverbal communication into seven different types. Bodily Action (Kinesics) – eye contact, gestures, facial expressions, and posture. For example giving good eye contact and nodding your head shows active positive listening. Use of Touch (Haptics) – embraces, kissing, pats, etc. Think about the last time you shook someone’s hand besides the idea of what a handshake means, was the person’s grip firm or soft? What did that communicate to you? Use of Space (Proxemics) – This communication style establishes relationships. Intimate (0-12”) intimate relationships and interactions, personal (1’-3’) acquaintances and friends, social (3’ – 5’ to 12’) business and professional interactions, and public (5’ to 12’ – 30’ to 40’) speeches, lectures, public ceremonies, etc. Use of Voice (Vocalics) – Pitch, volume, rate, and quality. How often does someone say, “they aren’t angry,” but their volume and pitch are telling you that they are in fact upset. Use of Time (Chronemics) – Duration, activity, and punctuality. What does it mean when someone is always late. A study conducted by Burgoon (1989) found that people who arrive 15 minutes late are considered dynamic, but much less competent, composed and sociable than those that arrive on time. Use of Objects (Artifacts) – this refers to the meanings attributed to objects that we surround ourselves. When most people see an octagon they think stop, which could be associated to the stop sign or when we see a circle with a line through it, we associate no to that sign. Physical Appearance – clothing, personal grooming and body type. When meeting someone new, how we communicate our first impression is very important and this is all communicated through physical appearance. Some things to keep in mind about nonverbal communication. Nonverbal cues are culture-bound. For instance if someone from the United States throws two fingers in the air to form a V, we think peace but that sign means something completely different to people from England. Nonverbal messages are often trusted more than the verbal when they conflict. Nonverbal messages are inherently open to more than one interpretation. Nonverbal communication can be deliberate or unintentional. At Terrapin Adventures we like to bring light to the importance of nonverbal communication in everything we do. We do this through a series of events and exercises focusing on verbal and nonverbal communication together and individually. To explore more non-verbal communication, click here. 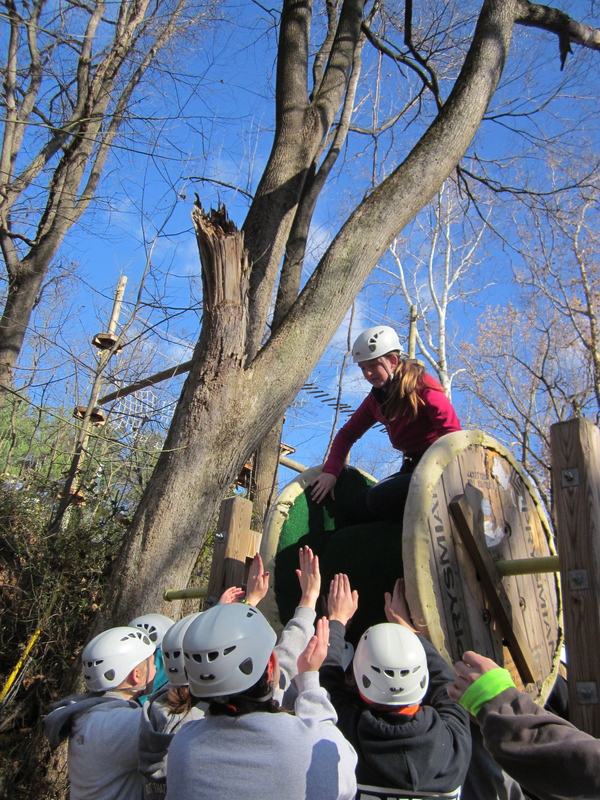 Terrapin Adventures, conveniently located in Howard County, Maryland, between Baltimore and Washington DC, offers custom onsite and offsite team building solutions designed to improve teamwork and foster business growth. Our years of experience in the corporate workplace allow us to apply the lessons we’ve learned to our Team Building Programs, in turn, achieving meaningful outcomes. Get in touch with a Guest Relations Specialist today and ask about how we can help you plan your team building event. Please call Terrapin Adventures at 301.725.1313, or email us at info@terrapinadventures.com. You can also follow Terrapin Adventures on Facebook, Twitter, LinkedIn, YouTube, Google+, and Pinterest for up-to-date information on events, trends, and other fun and exciting outdoor activities. This entry was posted on Thursday, April 3rd, 2014 at 10:00 am. Both comments and pings are currently closed.